I've written and spoken about my old buddy Frenchie a few times. 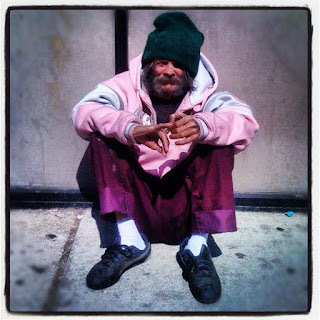 He passed away a few years ago, and to me, he'll always be remembered as that sweet, mysterious gentleman who quietly sat on Uptown's stained sidewalks. Everyone loved him and wanted to see him to move from Wilson's cold hard pavement into his own crib! That eventually happened! Frenchie maneuvered from the streets, through Cornerstone Shelter, to a subsidized apartment in Friendly Towers, until he eventually made the ultimate move and graduation to his resurrected body and celestial home! A more complete version of Frenchie's story can be found in something I wrote, back in 2013: Rest In Peace Frenchie. I consider myself extremely blessed to have known this gentle, kind man; and that's why I wrote what I did! Yet, today, I'm not rewriting another remembrance; I'm writing about an unexpected surprise, something that truly blessed me!